Once again, we looked at two well established names in the hosting business. SiteGround, because we’re familiar with it, plus I have the confidence that it serves as a good benchmark against which we can compare other hosting companies. 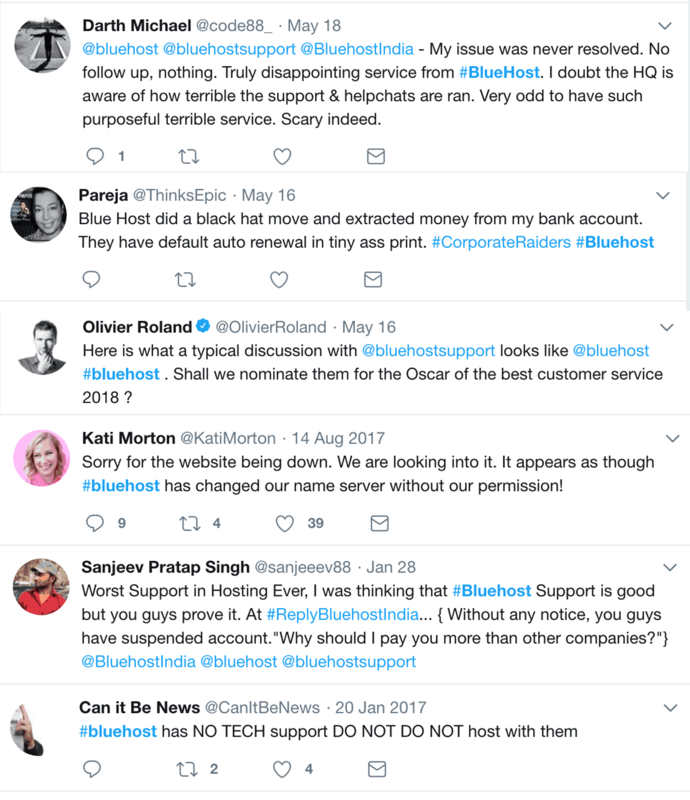 In a battle against what appears to be a strong offering from Bluehost, the latter was unfortunately dragged down due to a combination of factors, among them user complaints and a less than stellar reputation of the holding company, EIG. Overall, the results lean heavily in favour of SiteGround. In the hosting business for more than two decades, SiteGround has built its reputation from bottom up. Today, this formidable company hosts more than one million domains through locations scattered around the world. Notable among its offerings is its speed technology and along with automatic WordPress updates, frequent backups, free SSL from Let’s Encrypt SSL, all easily managed through cPanel, SiteGround is doubtless one of the kings of the web hosting arena. In comparison, Bluehost is today an EIG company, despite having been in the business as long as SiteGround has been. EIG is not traditionally a technology company, but rather its core strategy lies in the acquisition of hosting companies. EIG took over Bluehost following a disastrous introduction by its previous owner of CPU throttling, which ended up freezing hosted websites for hours each day. Key Features – SiteGround Offers FREE site transfers! The two test sites used in this review are owned and administered by Bitcatcha. Both SGUSHosted.com and BHHosted.com are hosted in their respective datacenter in USA. As is noted through the charts, the Bluehost Plus plan which runs at an introductory offer of $5.95 is being compared with SiteGround’s mid-tier shared hosting plan. In some key areas, SiteGround outstrips Bluehost except in storage space. This seems a little unusual, since storage space price is almost negligible to most web hosting companies today, but it is likely due to optimizations of equipment on SiteGround’s end due to their speed technology. Personally, I much prefer all the extended functionality that SiteGround offers rather than the unlimited storage space. The free migration is the REAL GEM here though, since not many hosting providers offer this for free. Learn more about the free website transfer. I have encountered this situation more than a few times in the past, and for those who don’t offer this for free, they charge an awful lot as well, starting from $100 and above for the most basic of sites! In fact, Bluehost wants to charge a whopping $149.99 for transferring your website. No way I’m going to fork out that kind of cash. SiteGround has a very good spread of locations for its data centres across three continents. It has one US location (Chicago), three in Europe (London, Amsterdam, Milan) and one in Asia (Singapore). These locations are strategic and offer SiteGround customers excellent speed in their hosting plans. Bluehost also relies on multiple locations, in the US (Utah), Europe (London) and Asia (Mumbai and Hong Kong). SiteGround obviously has its strengths in the US, although Europe services are also remarkably fast. There is slight latency in the Singapore location due to the distance from its physical server (Our test site is hosted in their Chicago datacenter). This seems offset by the fast that Oceania including Australia are apparently on par, which bodes well for other Asia located sites. Bluehost also shows fast server response times in many locations, but Europe seems to suffer a little. In fact, the speeds tested out of London are close to B-grade and would impact their overall ratings. In neck to neck comparisons, there might not be much of an apparent difference between these two. However, we can see that SiteGround servers offer much more stable timings than Bluehost across the board. I am happy to say that for both hosts, uptime does not seem to be a major concern. Over a 30-day period, both have displayed 100 percent uptime which is very good. If you’re not familiar with uptime, most hosts offer a minimum of 99 percent and even a few minutes down can have a significant impact on this number. There is, however, an added element to uptimerobot that many people oversee, since it’s basically intended to show…well, up time. 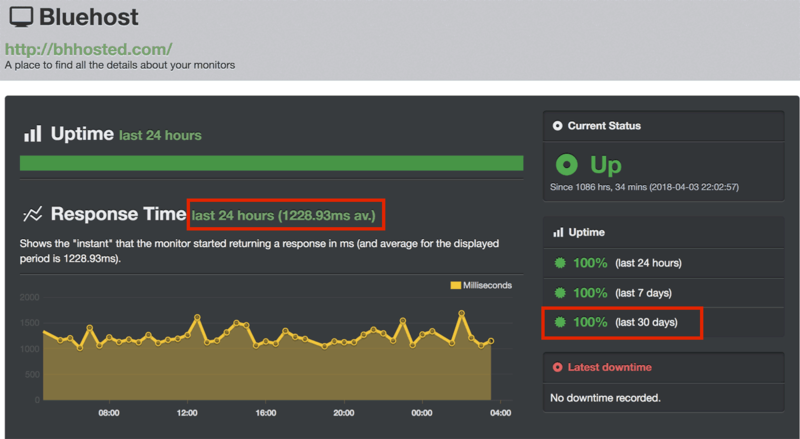 If you take note of the graphs in each image, these show the typical response times that the servers display. 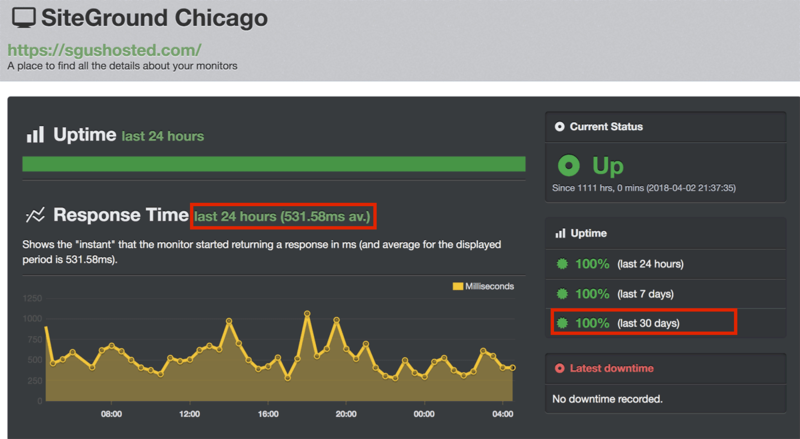 Although both boasting 100 percent uptimes, Bluehost has a response time that lags significantly behind SiteGround. This is one of the significant things I feel are underlying factors that affect a host’s ratings. One of the key things in dealing with a web host – and I cannot stress this enough – is their customer support. Even if you are a casual user and envision needing some help only once in a long while, dealing with unresponsive or lackadaisical support staff can be extremely infuriating. And believe me, you’ll probably be needing their help far more often than you’ll expect. From issues like downtime to server connectivity and security, your key connection to the host is via their support staff. There is nothing more important than a support team that responds quickly and efficiently. So, what have these two giants got for us in terms of support? 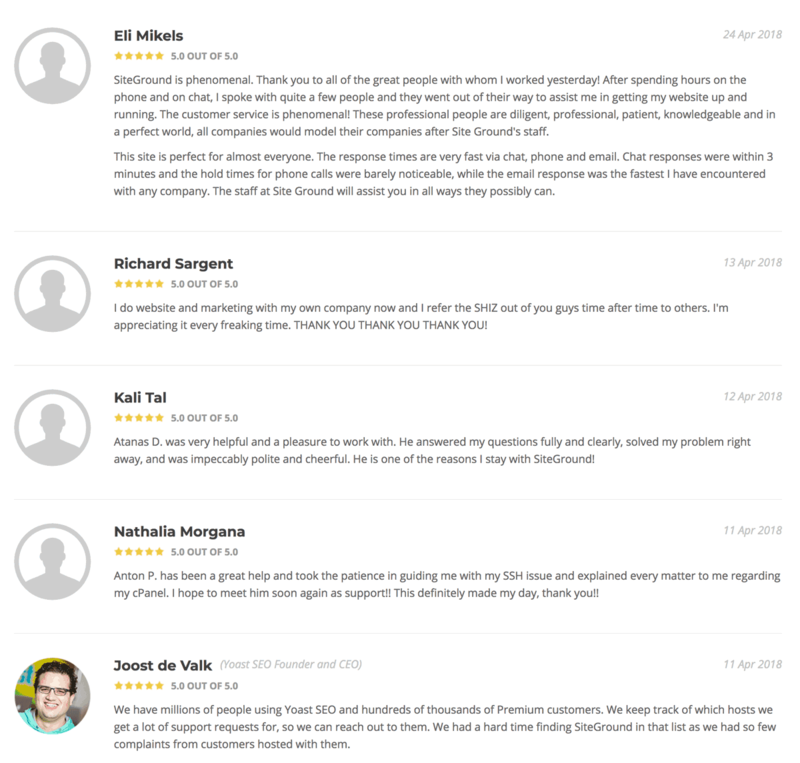 I’m extremely happy to note that SiteGround runs the full gamut in support, offering 365-day live chat services, a ticketing system and even a number you can call for help. Given past experience with some live chats, I breathed a sigh of relief when my message was responded to within 10 seconds. There have been occasions before when I was kept waiting so long I thought the chat system was broken! The setup is similar at Bluehost’s customer service and although I was not kept long here, I still feel a little leery about their support. This comes back to the fact that Bluehost is an EIG company, which I have heard so many negative things about. In fact, the issue came up just in my previous comparison review, which you can read about here – SiteGround VS Hostgator. The key crunch comes in when it’s time for the public to review their services, however. It’s here that we dig deeper behind the scene and find out what’s really what. 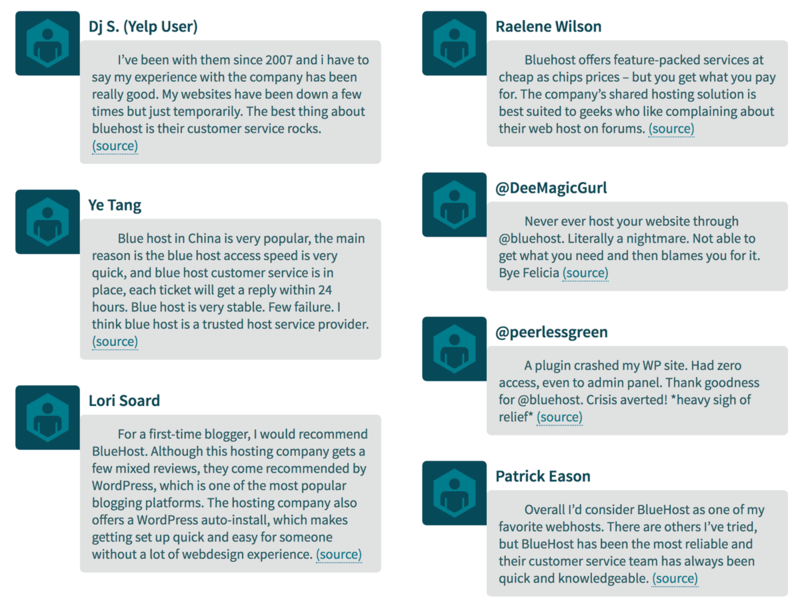 As you can see, there are mixed emotions when it comes to Bluehost, which is something to be concerned about. To be unable to offer a stable service stream to clients is a problem and note should be taken of this. For those of you who might be new to web hosting, there are two aspects to the term ‘user interface’ when it comes to your hosting accounts. The first your interface with the web host account, which is a much broader view of the services you’re using. The other is the control panel that is intended to handle the functionality of your web hosting plan. The latter is more critical as that is where you’ll spend most of your time and effort. Both SiteGround and Bluehost offer cPanel, albeit slightly skinned to make it look a little more unique. cPanel is a great choice as it offers users an extremely user-friendly way to manage their websites. It is also a very common interface, which means that if you need help, it’s only a stone’s throw away. Although Bluehost offers what they call an Enhanced Version of cPanel, to be honest I feel that it’s more like a simplified version. True, this is good for first-time web host buyers, but in the long term I feel there is more flexibility in SiteGround’s offering. Feeling your way around the development of a website doesn’t take an awfully long period of time. As you go along, you’ll find that having access to more functionality is a very good thing, especially since it means that you don’t have to reach out to your host’s customer service staff as often. Tons of experience, an unblemished track record and impressive performance. These key highlights make SiteGround stand head and shoulders above the competition in terms of shared web hosting offerings. Their claims to speed technology are hard to beat, even if it comes at a slightly higher price tag. What can I say? I’m a sucker for low prices and matched neck and neck, there’s no comparison between SiteGrounds shared web hosting plans versus Bluehosts. For a web hosting provider, even if it’s only for the initial sign up period, Bluehost has dirt cheap plans and you’ll be hard pressed to find many that are lower priced. Even though I know that there are complaints and bad reviews out there, the price draw is irresistible. But that’s just me because I’m an el cheapo who doesn’t really use my sites for much of anything. Yes, there are things I love about what each host is offering, unfortunately, my personal love for a rock-bottom price aside, I really can’t deny that SiteGround offers the better deal. Aside from features included in the plans, the real kicker is the bad reputation that follows EIG around like a dog on the heels, nipping away all the time. As they say, the proof is in the pudding and the public has also spoken. That added to SiteGround’s excellent reputation makes it a hands-down no brainer here, that they are the champions.